Welcome to the official website of the 3-Creeks Natural Area! 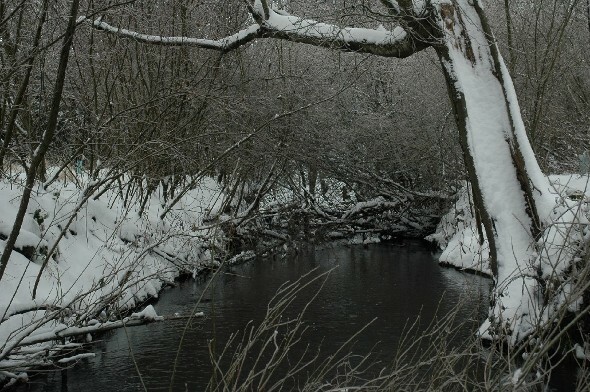 The '3-Creeks' is approximately 89 acres of streams, wetlands and upland habitat consisting of Mt. Scott Creek, Phillips Creek and Deer (Dean) Creek. The streams provide habitat to a resident Cutthroat Trout population, and a very small number of still returning Coho Salmon and Steelhead. On the banks live otter, mink, deer, coyote, long tailed weasel, beaver and a host of bird species. The site is wedged in between industrial and commercial properties, a set of active railroad tracks, roads, college campuses and private homes. In the late 90's the land and water were found to have significant pollution. The site is also home to a flood control facility which stores water during the heaviest rains each year to protect businesses, railroad tracks and homes downstream. The 3-Creeks is prone to floods yearly as the heavy rains overload the stream system, jumping the banks and flowing through the large grassland/wetland complex. This provides an essential 'sponge' effect, soaking the water and delaying or avoiding flooding downstream. Protecting these wetlands is a long upland forested section dominated by the Oregon White Oak, also known as Garry Oak (Quercus Garryana). These trees have been estimated to be anywhere between 200-500 years old; they are truly the giants of the tree community! Some of the biggest oaks are right behind the N. Clackamas Aquatic Park. This is rare habitat and has specific bird and animal species that depend on it for survival. This rare oak forest is under threat of the chainsaw and asphalt from Clackamas County. Read on to learn more about our big wetland and rare upland forest, and come out and join us for a work party. Welcome to the 3-Creeks! What's with the upland Oaks? Less than 3% of the Willamette Valley's original Oak habitat remains intact. It is no wonder then that these last few scraps of Oak land are so precious to 3-Creeks and to the people that enjoy their canopy. One visit to the site and you'll notice that the area inhabited by these 200-500 year old Oaks are very special. Besides the habitat they provide, these Oaks are estimated to hold over 46,000 lbs of CO2 , each! (Based on US Forest Service CUFR Tree Carbon Calculator. Figures are for Northern Red Oak.) In terms of CO2, that's the equivalent of 8600 gallons of gasoline...per tree! (based on USEPA numbers ) Each of the trees can intercept 4600 gallons of water each year. Besides that, the trees protect the wetlands and streams by preventing erosion which would eventually impact the salmon spawning grounds. 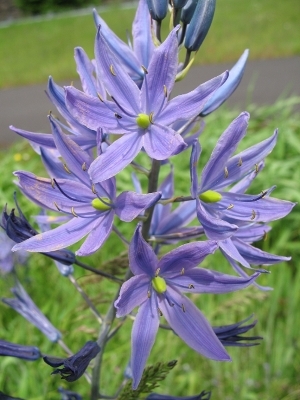 OSU botanist Dominic Maze has issued a statement about the Old-Growth White Oaks at 3-Creeks. Read it here ! Here is another good paper on Upland Oak Woodlands . Once upon a time the 3-Creeks Natural Area and miles of its surroundings were forested wetlands, wet meadows, streams, grasslands and upland old growth oak forest. One look from an airplane or overhead photo will tell you that the 89 acres is the bare remnants of this habitat. The industrial area to the south was once wetland. The Precision Castparts Corp building also used to be a wetland. The construction of 82nd avenue filled a wetland. From around the early 70's up to the early 90's there used to be a horse riding operation on the wetland. There are old photos of the houses and barns. Around the site we see occasional house foundations and non invasive landscape plants that clue us in to past residences. 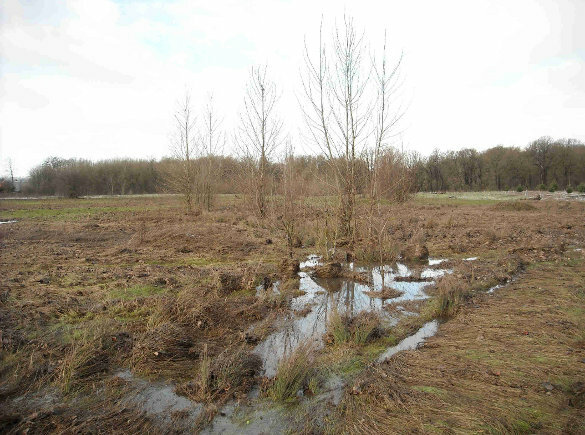 In the 1990's Clackamas County bought the polluted wetland and the county's Water Environment Services (WES) began their restoration projects. In the same time period ODOT and the Railroad (UPRR) worked on their polluted sites in the 3-Creeks too. Rumor has it a dry cleaning company was dumping their 'perc' into trenches in the wetland (thank you dry cleaners). In 1999 the first of many tree plantings took place with community volunteers, and in 2000 Friends of Trees (FOT) helped lead the plantings. In 2001 the all-volunteer stewardship group, the Tsunami Crew, was formed to shepherd the 3-Creeks through its restoration phase. The Tsunami Crew is a project of FOT in coordination with WES, The Friends of Kellogg & Mt. Scott Creek and the North Clackamas Urban Watershed Council (NCUWC). 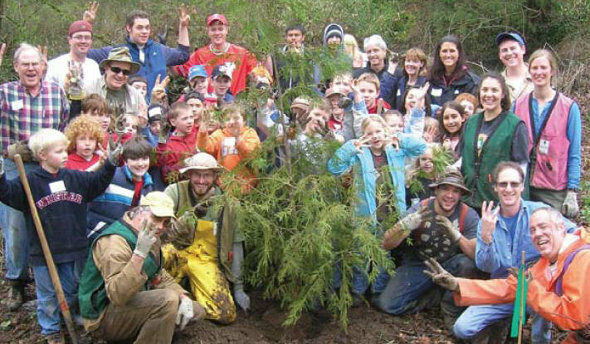 In 10 years the volunteers have planted over 21,000 native trees and shrubs and have worked over 13,000 hours planting trees, removing invasive weeds, pulling garbage from the creek, leading tours, coordinating agency groups and defending the natural area from gratuitous destruction. For the last 9 years the Tsunami Crew has held work parties EVERY Sunday morning! The 3-Creeks Natural Area is where Mt. Scott, Phillips and Deer (Dean) Creeks come together on 89 acres in Northern Clackamas County. Some people know this better as the Clackamas Town Center area. To access the site safely, it is easiest to park at the North Clackamas Aquatic Park at 7300 SE Harmony Road. This is where OIT and CCC campuses are too. Walk south from the Aquatic Park and you will see unofficial trails leading into the natural area. Don't bother calling the Aquatic Park because they will not know anything about the site. Just take advantage of the asphalt that used to be an old-growth oak forest and be on your way. Map of Three Creeks and surrounding area. Please note that while this will someday have an official trail system coordinated through the North Clackamas Parks District, currently it is a 'use at your own risk' setup. There are plenty of trails, some of them completely under water in the wet season. There are also occasional illegal camps hidden in the woods. We recommend walking with a partner and avoiding the camps. The sheriff sweeps through occasionally. We don't recommend other access points because of RR crossings or Harmony Road crossings. However, Pheasant Ct., off Hwy 224, ends right at the 3-Creeks. There is also a locked service road across from Cedar Crest Dr. along Harmony Rd. Both of these make good entries if you can negotiate the traffic and trains. NOTE ON TRAINS: The Amtrak is fast, silent, and deadly! If you are anywhere near the tracks always look continuously for trains. Someone or some dog gets killed there every year or two. Enjoy the 3-Creeks! It's a great spot in the middle of the city! Wetlands are complicated areas from a geographical perspective. A wetland is basically an area whose water table sits at or near ground level. This creates large patches of grassland which, from the air, might look quite barren. In fact, these grasses are home to small mammals, as well as amphibians and fish. All of these small critters act as food for the many hawks, herons and coyote which make their homes at 3-creeks. 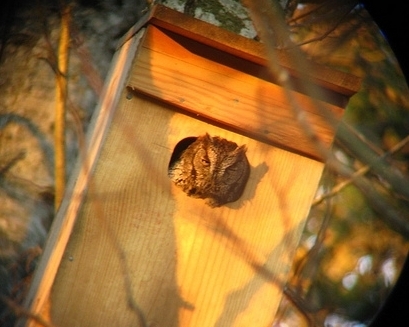 The food chain is completed entirely within the 89 acre wetland and upper oak habitat. This is truly amazing from a biological point of view. Hydrology of Three Creeks and surrounding area. For 6 months out of the year, 50% of 3-creeks is under about 3 inches of water. This makes the wetland a very quiet and serene atmosphere during the winter months. Just don't forget your rain boots! Why are our wetlands in danger? Some people may look at the 89 acres of 3-creeks and think that it is quite large. In fact, over 80% of the original wetland has been filled over the past 30 years. 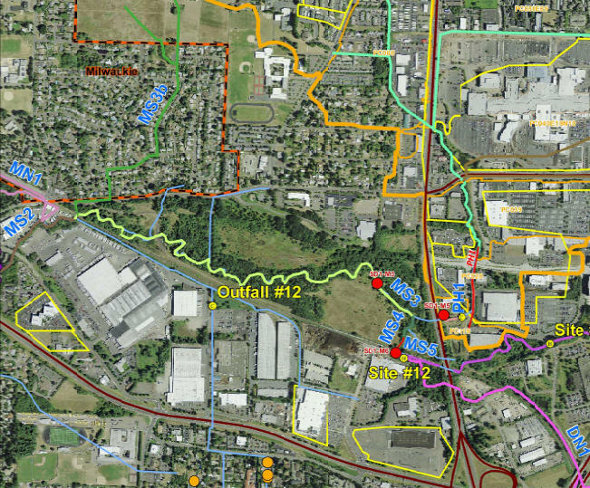 The construction of Clackamas Town Center, Costco Shopping Center, and the Milwaukie Business-Industrial area all created fill areas where wetlands once used to exist. This means that 3-Creeks has to do 3 times the amount of water filtration and habitat accommodation that wetlands are so good at. Wetlands are important because they usually have a direct connection to local ground water. Since many of the ground water wells in Clackamas County are located near these low lying areas, there is a direct link between the quality of drinking water in the county and the health of the wetland. Ever wonder why Milwaukie's water is chlorinated? Part of the reason is the displacement of local wetlands and the placement of industrial areas and impermeable surfaces (roads, buildings) in such close proximity. It's important to keep a few things in mind when walking through 3-Creeks and enjoying the area. These pointers are intended to keep visitors safe as well as maintaining the natural beauty of the area. Try and visit the area in small groups. Company is always best when visiting a new place, and 3-Creeks can have many surprises. It's true that there are many unauthorized 'camps' in the area. Most of them are usually empty during the day. Even still, it's best to leave any camp sites you find alone. Please also be careful when cleaning up trash around camps, and report any camps that you find which contain drug paraphernalia or excessive litter. Please also report any campsites on our discussion forum . Given the sensitive nature of this natural area, we encourage you to keep your canine friends on a leash. Also, please clean up after your pets and avoid letting them swim in the streams. The water at 3-Creeks drains into the ground wells, and the fragile creek banks are trying to be restored to bring local salmon populations back to the area. We appreciate your coopration. Explore the area and discover the silence! The drone of nearby industry is quickly forgotten after a few minutes of sitting by the creek bank and watching the birds. The Tsunami Crew is a group of local volunteers that meets at 3-Creeks each week to help restore the area and enhance its natural beauty. The crew started with a Friends of Trees work party over 9 years ago and continues today under the watchful and patient eye of Chris Runyard, a local salmon habitat expert and ex-Navy pilot. The crew works on invasive and non-native species removal and strategic native habitat development that is specific to the area. The expertise of many long-time volunteers has helped destroy the majority of the 'Blackberry Brambles', 'Teasel Thickets' and 'Holly Hell Holes' which once dominated the area. In their place, they've inserted such native species as Rose, native Hawthorne, Snowberry, Ninebark, and many more. If you're interested in joining the crew for some shearing and tea drinking, email tsunamicrew at 3-creeks dot org. December camp cleanup a huge success! Railroad Cuts Down Trees on Dean Creek!